Ning Kam has given many concerts in Europe, Singapore, Canada and the United States. She has performed at the Menuhin Music Festival in Gstaad, Switzerland. In 1988 she appeared on BBC's Blue Peter, where she played to a television audience of seven million. In that same year, she performed the Mendelssohn Concerto at the Royal Festival Hall, with the Wren Orchestra. Since then she has appeared with the Royal Liverpool Philharmonic Orchestra, Toronto Symphony, Cleveland Orchestra, National Orchestra of Belgium, Royal Flanders Philharmonic, Flemish Radio Orchestra, City of London Sinfonia, the Orchestra della Svizzera Italiana and the Singapore Symphony Orchestra. As an active chamber musician, she participated at the prestigious Ravinia Festival at the Steans Institute for Young Artists 2000. Ning released her first CD in 1997, featuring the works of Enesco, Sarasate, her father, Kam Kee Yong as well as transcriptions by Heifetz. Most recent releases are a CD dedicated to the music of the Americas entitled "Transatlantic", and a recording, "Cicada", dedicated solely to the music of Kam Kee Yong. American Record Guide has praised "Transatlantic" as "energetic and virtuosic" as well as having "humour, lightness and strength". ClassicsToday.com has called Kam's playing "stunning" and "fiendish" and a 10/10 was given by the Belgian music magazine "Crescendo" for this original recording. Ning released her debut recording with orchestra of the August De Boeck Violin Concerto with the Flemish Radio Orchestra conducted by Marc Soustrot, under the Etcetera label. Other releases in 2008 also include the chamber music of Alexander Goehr on the Meridian Records label, where Ning performs as part of the Chiron Trio with pianist Daniel Becker and cellist, Thomas Carroll. Ning has performed in concerts all over the world with the Singapore Symphony, Luxembourg Philharmonic, Hong Kong Sinfonietta, Bournemouth Symphony, Royal Flanders Philharmonic, Flemish Radio Orchestra, Flemish Symphony Orchestra, Brussels National Orchestra, Liege Philharmonic, Shenzhen Symphony, Malaysian Philharmonic Orchestra and Helsinki Philharmonic Orchestra. As an artist who has great interest in championing contemporary music, Ning Kam gave the world-premiere of Claude Ledoux's "Frissons D'Aile", a concerto for violin and orchestra dedicated to Ning and commissioned by the Liege Philharmonic. In January 2005, she performed with pianist, Daniel Becker at London's Purcell Room in the Park Lane Group Series for Young Artists featuring contemporary music. This concert was reviewed by the London Times as "gutsy and electrifying". The Telegraph also described Ning as a violinist with "much flair plus a totally confident stage presence and an absolute command of the music" and that the performance had "thrilling energy and control". She has also been invited to broadcast on the BBC Radio 3 programme, "In Tune" in January 2005 and made her successful Wigmore Hall debut in May 2006 with British pianist, Carole Presland, as part of the Park Lane Group Series. Concerts in the 2007-2008 season included appearances with the Singapore Symphony Orchestra, Klassische Filharmonie Bonn, Flemish Radio Orchestra, as well as recitals in Taiwan, Belgium, the United Kingdom and the USA. Special projects that season included a Taiwan concert tour with percussionist, Francis Kam in a ground-breaking violin and drums programme. The 2008-2009 season included her debuts with the Phoenix and Tucson Symphony Orchestras as well as recitals and chamber music as part of the Concerts du Midi series at the Musee Royaux des Beaux-Arts de Belgique, at Kings Place, London and at the Ulverston Festival, UK. Ning also made her leading and directing debut with the Het Kamerorkest Brugge in Belgium in 2009 and has returned every season since as leader and director of Het Kamerorkest Brugge. 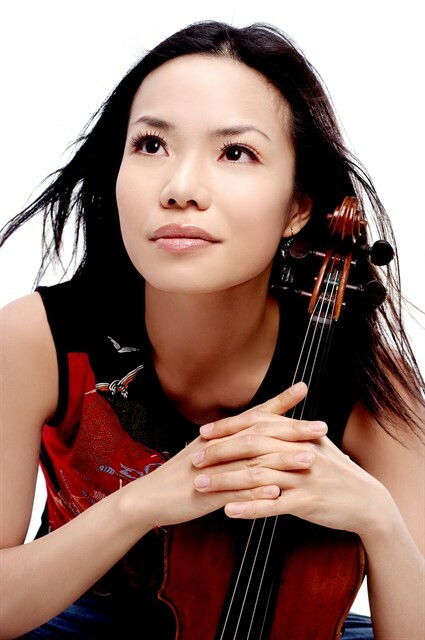 2010 also saw Ning's China debut with the Shenzhen Symphony Orchestra with whom she will return in the 2011-2012 season with conductor, Christian Ehwald. Beginning in September 2011, Ning will commence in her role as the new Artistic Director of Het Kamerorkest Brugge. Other engagements in the 2011/2012 season include a return with the Symfonieorkest van Vlaanderen with conductor, Guy van Waas as well as a new recording with pianist, Albert Tiu, under the Meridian Records, UK label.